Yellow Squash is one of those vegetables that seems to do really well in a supporting role with other main ingredients. It isn’t necessarily something I wouldn’t make on its own, but I seem to have a lot of recipes that use it as a filler of sorts. 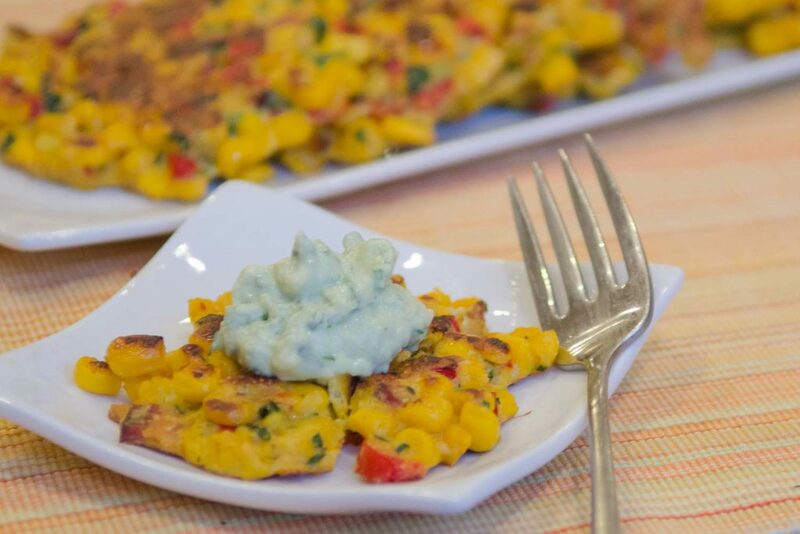 Here in this corn fritter recipe, it helps with creating a chewy interior that would otherwise be taken up by a lot of breadcrumbs or dough. Because of the high water content, it also helps to keep the fritters moist throughout. A little extra crunch, and some color, comes from the red pepper. If you want to give these a little more heft, you could substitute chunks of pepperoni in instead of the chopped red pepper. The fritters themselves are really easy to make. The dip to go with them is even easier. It’s just 1 avocado, about 1/4 cup of greek yogurt and a small handful of chopped cilantro. It’s so simple and tasty, I use it as a good all around dip with many other dishes.